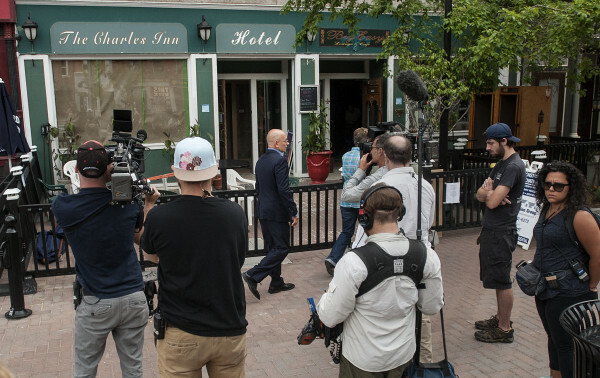 'Hotel Impossible' host Anthony Melchiorri (center) participates in the filming of an episode at The Charles Inn in Bangor recently. BANGOR, Maine — The reality television show Hotel Impossible filmed last week at The Charles Inn. As filming wrapped, Paul Beaulieu, who ran the hotel bar known as the Big Easy Lounge, announced the bar was closing and he had been ousted from the building as a result of the filming. Now the hotel owner is speaking out, saying the show did not cause her to close the bar. According to Connie Boivin, she was planning to close the bar before the filming crew arrived, a fact she said Beaulieu was aware of. Since the popular downtown bar shuttered, local people who don’t understand the situation have been really upset with her, Boivin said, many voicing their displeasure online and in person. The bar, she said, was closed to improve the experience of the guests staying in the hotel’s 30 rooms, many of whom must wake early for morning meetings. “Guests come in and there’s drunk people and people vomiting in the urinal and dancing in the front, and people trying to get in … have to go around the drunk people that are dancing and the music is loud,” she said. Boivin also disputed Beaulieu’s claim that he owned the bar in question, saying he was an employee of the hotel better described as the bar manager, though the small company doesn’t really have formal titles. City records show the bar’s liquor license is registered to The Charles Inn under Boivin’s name. She said the Big Easy Lounge is not a separate company or a licensed name. “We opened the bar with a separate name just to give it a name, just like I name my meeting rooms,” Boivin said. In a statement to the Bangor Daily News, Beaulieu maintained he was the bar’s owner. He declined to respond to questions about whether there were plans in the works to close the bar before filming, citing a nondisclosure agreement he signed that bars him from discussing details of the show. “I really don’t have or want to respond in any kind of negative way,” he said in a statement. “(The) bottom line is Connie and I tried to keep things amicable, but it just did not work out that way. “Granted, I ultimately wish we would (have) handled this quite differently as I am not fond of airing any negativity to the general public,” he said later. “I just want the negativity to stop and people need to watch the show,” Boivin said, adding that she was told the episode would broadcast sometime in the fall.